The Radisys CellEngine™ portfolio of small cell software delivers pre-integrated, deployment-ready 3G and LTE small cell solutions—accelerating mobile operators’ time-to-market. The TOTALeNodeB™ LTE small cell software is a turnkey solution built on the foundation of market-leading Trillium LTE small cell protocol software and applications with RRM, SON and OAM. TOTALeNodeB supports both FDD and TDD deployments, enabling customers to leverage one LTE small cell solution that is able to scale easily from small to large deployments. It supports carrier-grade, application-ready C-RAN platforms, allowing mobile operators to maximize the speed of network functions running in a virtualized environment. 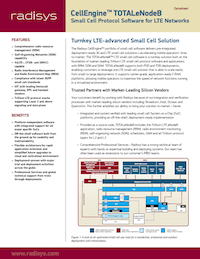 Register to get "Datasheet: CellEngine™ TOTALeNodeB – Small Cell Protocol Software for LTE Networks ".